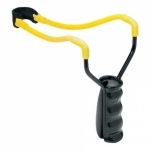 Features a molded sure-grip handle and a solid steel frame with extra-wide fork. Strong and sturdy. Surgical-grade tubing and durable release pouch provides all the power you need. Shoots 1/4", 3/8" and 1/2" steel or glass shot. Daisy’s PowerLine Slingshot Model F16 is appropriate for adults and those over 16 years of age under adult supervision.